Pictured L-R: (Standing) Mike Clink (P&E Wing Co-Chair); Chuck Ainlay; Eric Boulanger; Maureen Droney; Dan Workman; James McKinney(P&E Wing Co-Chair); Ed Cherney; (Seated) Carlos Alvarez; Phil Nicolo; Bob Ludwig; Richard Burgess. Photo courtesy of The Recording Academy® © 2012. SANTA MONICA, CALIF. (Nov. 15, 2012) — The Recording Academy® Producers & Engineers Wing® has announced its 2012-2013 Steering Committee, the leadership group of the P&E Wing, which researches and recommends solutions for technical and economic issues facing today's music production professionals. The newly seated Committee, consisting of a diverse array of music engineers, producers and audio professionals, will build upon the significant legacy established by prior Steering Committees and work to identify and evaluate key issues confronting music production professionals, with the goal of finding meaningful solutions and suggestions for the industry moving forward. 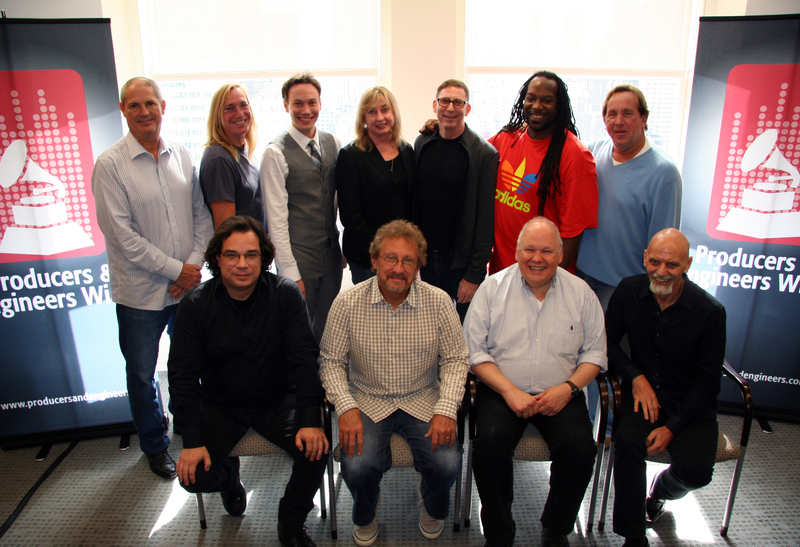 The P&E Wing 2012–2013 Steering Committee includes the following music industry professionals: Chuck Ainlay (Nashville), Carlos Alvarez (Miami), Eric Boulanger (Los Angeles), Richard Burgess (Washington, D.C.), Ed Cherney (Los Angeles), Mike Clink (Los Angeles), Bob Ludwig (Portland, Maine), James McKinney (Washington, D.C.), Phil Nicolo (Philadelphia), and Dan Workman (Houston). Steering Committee Co-Chairs Mike Clink and James McKinney will remain in their current positions as the P&E Wing continues to advocate for excellence in sound recording, audio technologies, education in the recording arts, and the rights of music creators overall. "We owe a great deal of gratitude to all of our past Steering Committee members, including John Alagia, Jeff Balding, Jimmy Douglass, Nathaniel Kunkel, Glenn Lorbecki, Sylvia Massy, Keith Olsen, Phil Ramone, Elliot Scheiner, Tommy Tallarico and Eric Schilling," states Maureen Droney, Sr. Executive Director of the P&E Wing. "They laid the groundwork and continue to be involved in our initiatives as we more forward. Many would agree that this is a trying time in the industry, and we need the talents of all of our members to face these challenges, find solutions and proceed with new paradigms." Chuck Ainlay is a multiple GRAMMY® Award-winner, one of Nashville's top recording and mixing engineers, a pioneer in using surround sound technology, and a leading advocate for high quality audio. He has worked as a producer or engineer for such diverse talents as Dire Straits, Emmylou Harris, Taylor Swift, Miranda Lambert, and many more. Ainlay was the ACM Engineer of the Year in 2009 and 2011. Carlos Alvarez's engineering and production career has taken him around the world working with a variety of artists including, Marc Anthony, Ricky Martin, Carrie Underwood, Juan Luis Guerra, and Julio Iglesias among others. He’s won three GRAMMYs and seven Latin GRAMMYs for his work with and including, Alejandro Sanz (El Tren de los Momentos, Best Latin Pop Album 2007), Jose Feliciano (Senor Bachata, mixer-Best Tropical Album 2008), Luis Enrique (Ciclos, mixer-Best Tropical Album 2009). Serving on The Recording Academy's Florida Chapter Board of Governors since 2002, he lives, plays the bass, and operates his studio in South Florida. Eric ‘V’ Boulanger of The Mastering Lab is a classically trained violinist who has performed at some of the most celebrated venues in the country. Eric holds a degree in electrical engineering from Carnegie Mellon University, and has mixed and/or mastered records across a variety of genres with credits including Colbie Caillat, The Bravery, Kate Bush, and Chris Botti. With the P&E Wing, Eric has taken a lead role in Apple’s “Mastered for iTunes”, which aims to improve the quality of current and future downloaded music. Richard James Burgess Ph.D. has produced, recorded and/or performed on numerous platinum albums with such diverse artists as Spandau Ballet, America and New Edition. He authored The Art of Record Production in 1997 and the second and third editions entitled The Art of Music Production, now being updated for a fourth edition on Oxford University Press. He is also known for his pioneering work with synthesizers, computers and sampling. Recently, he produced the six-disc box-set release JAZZ: The Smithsonian Anthology. Ed Cherney is a GRAMMY-winning producer/engineer known for his work with a variety of artists, among them Eric Clapton, Bob Dylan, Bonnie Raitt, and the Rolling Stones. Over the years, he has amassed six GRAMMY nominations and two wins, in addition to seven TEC Award nominations and five wins, as well as three EMMY nominations. A founding member of the Music Producers Guild of America, the P&E Wing's direct forerunner, Cherney has also served as Governor of the Los Angeles Chapter of The Recording Academy and is a board member at McNally Smith College. He has recently completed a Latin Jazz album for Alejandro Fernandez, along with a new Matthew Morrison (Glee) project, both with Phil Ramone producing. He is currently producing tracks for the band Honey Honey. Mike Clink has produced projects that have sold more than 70 million records worldwide. Known for working with legendary rock acts such as Aerosmith, Guns N' Roses and Metallica, Clink also specializes in developing new talent for his label, No Relief Records. A pioneer in live recording and distribution, he started a new media company that specializes in the instantaneous fulfillment of CDs with added value content available immediately after a concert event. Clink frequently speaks on panels for The Recording Academy and the Audio Engineering Society (AES). Bob Ludwig is a multi-GRAMMY and Latin GRAMMY-winning mastering engineer with degrees in music education, performance (trumpet) and music literature from the Eastman School of Music and an honorary doctorate from the University of Southern Maine. He was the first person to be honored with the Les Paul Award for "consistently outstanding achievements in the professional audio industry," as well as the TEC Award for "Outstanding Creative Achievement, Mastering Engineer" an unprecedented 15 times. He served as Co-Chair of the P&E Wing from 2004-2008. James McKinney is Committee Co-Chair and an accomplished pianist/keyboardist, vocalist, musical director, songwriter, arranger, producer, educator, businessman and philanthropist. Since relocating to Washington, D.C. in 1988, McKinney has performed for three U.S. Presidents and has performed with the likes of Kenny Burrell, Kenny Lattimore, Stevie Wonder, and more. McKinney serves on the Board of the Washington, D.C. Chapter of The Recording Academy and is also a National Trustee. Phil Nicolo is a GRAMMY-winning producer/engineer who founded Studio 4 in 1980, a recording studio in Philadelphia where he and his brother established themselves as a force in all genres of music production, from rock to R&B, mainstream to cutting edge. In 1989, Ruffhouse Records was launched out of Studio 4 operations, and over the next ten years was responsible for the careers of Lauryn Hill, the Fugees, Cypress Hill, Wyclef Jean and Kriss Kross. Phil's producing and engineering credits include Aerosmith, Billy Joel, Bon Jovi, Urge Overkill, Sting, among many others. Current projects include new releases from Rusted Root, Title Fight and Lauryn Hill. Phil is also President of the newly relaunched Ruffhouse Records. Dan Workman is president of SugarHill Studios, Houston, Texas, the oldest continuously operating recording studio in the U.S. He has engineered GRAMMY-winning, and platinum recordings for Texas' most notable artists including Beyoncé, Destiny's Child, Clay Walker, and ZZ Top. Workman now produces full time, is currently working with Kareem Salama, The Southern Backtones, The Wheel Workers, and opera chanteuse, Alicia Gianni. Photo Caption: Pictured L-R: (Standing) Mike Clink (P&E Wing Co-Chair); Chuck Ainlay; Eric Boulanger; Maureen Droney; Dan Workman; James McKinney(P&E Wing Co-Chair); Ed Cherney; (Seated) Carlos Alvarez; Phil Nicolo; Bob Ludwig; Richard Burgess. Photo courtesy of The Recording Academy® © 2012.